Since My Digital Life last giveaway for Demonoid invitation code, thousands more of people has requested for a free invite to register for Demonoid account. Although Demonoid does open its account registration to general public without invite once or twice a month, not everybody manages to get one free Demonoid account. Thanks to RockFemNotFellas aka “Dan V”, who sponsors 4 invites to open an account at Demonoid, MDL is giving away 4 Demonoid invitation code to 4 lucky readers. Contest Closed. 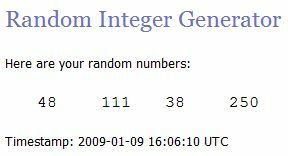 Random numbers have been generated to determine which comment posters are winners. The winners are: Andy Robs, Gurinder, Conie and henry hung. Winners please check your email and reply, or use Contact form to contact us, else the prize will be withdrew and give to new selected winner. Update: Invalid emails for two of the winners. So, SaggyBalls and Kedrew have been selected as new winner. Watch this space. My Digital Life may have more invites to giveaway. To get a chance to win one of the free invitation code to sign up for an account on popular Demonoid.com torrent tracker, all you have to do is just post a comment in the comment section below. All comments must be posted (has the time stamp that appeared with the comment) before or on January 9, 2009, 23:59 pm (server time is based on GMT + 8). After the giveaway contest closed, a random pick and selection of 4 winners will be done, and each one of them will receive an invitation to register a Demonoid account. Each participant can post as many comments as he or she wants in order to increase chance of winning. However, each participant can only win one invite code. In the event the random draw selects the same winner again for the second time, it will be ignored and will be redraw to another winner. All comments must be posted with a valid email address in the “Email” text box, which will be hidden but available to MDL administrator. DO NOT post email address inside comment to avoid spam. Invalid email address automatically disqualify the entry. My Digital Life reserves the rights to change the terms and conditions of giveaway at anytime without prior notice. All decisions is final. Happy winning and start commenting now!